This guide was written in February 2014 and applicable as of then. 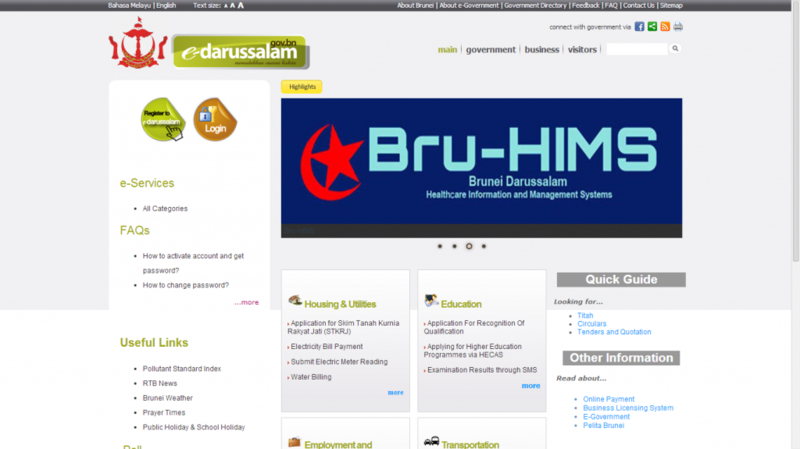 In November 2014, the e-darussalam (gov.bn) website was revamped. While some features remain, my specific screenshots are no longer applicable. The ability to search all Brunei government domains is still possible at http://is.gd/govbnsearch but I am not sure if the search index is up-to-date. This will be my last update on this post; any writings about future changes to the website will be published in a new post. You may never have heard of e-darussalam. It is a Brunei Government portal that was launched in 2011 with the shortest Bruneian domain name: gov.bn, in hopes that people would find it easy to remember. Since its launch, it has been under the management of EGNC, or E-Government National Centre, a department under the Prime Minister’s Office. I wrote this “guide” because I think e-darussalam has some neat features that are not highlighted well. Please note though, I have focused on the main “website” portion of e-darussalam, rather than its e-services that require login. Also, a disclaimer: I used to work on e-darussalam. Yay. i. Getting an error page or blank result page? ii. 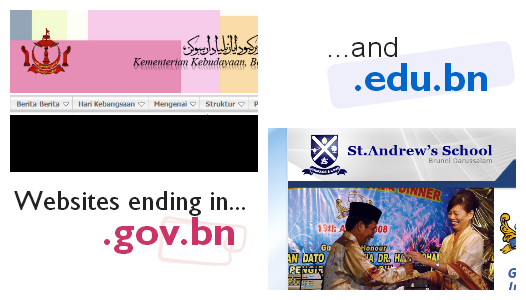 Which Brunei Government websites are covered? Yes, the search box at the top-right corner of the page, as well as most other pages of e-darussalam, can do this. Give it a go. … Just kidding. Read on. Or go to http://is.gd/govbnsearch instead. Yes, I made this short URL just for you guys. The long URL is above is actually the same as the search results page. That’s why I wasn’t panicking. You could also just go to www.search.gov.bn but, er, it’s not exactly the same. It may give different results, and also, you don’t get the “specialised” searches that I will mention later on. I’m not tracking the analytics for the short URL at is.gd, so chill out ‘kays. I believe most Government-run schools that do have websites do not use *.edu.bn, but maybe there are some stray ones that do. But it isn’t guaranteed! 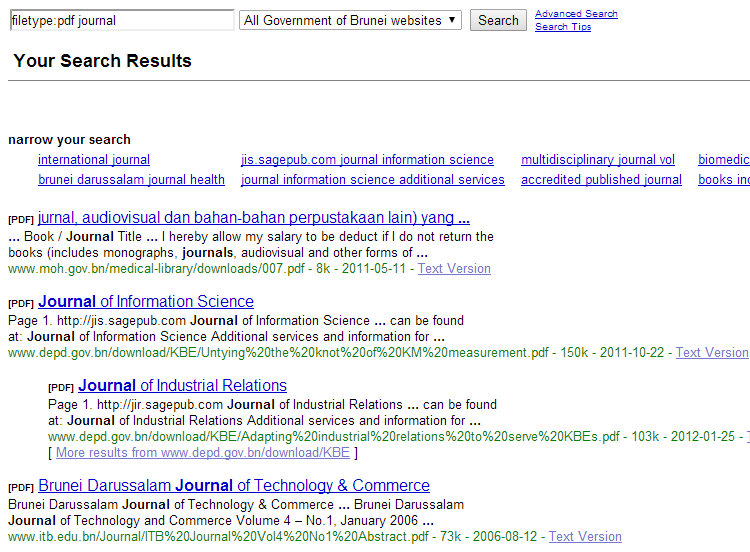 The search may not show results from all Brunei Government websites. This is especially true for new URLs, which may take time to appear, for example if the Ministry of Finance decided to switch to finance.gov.bn from mof.gov.bn. What can you do, if you suspect a Government website isn’t showing up in the search? Why, send the e-darussalam team an e-mail, of course! 😉 Contact details are at the end of this post. You can search for files with a specific file type. Supported file types: DOC (Word), XLS (Excel), PPT (Powerpoint), PDF. It can be surprising to see the kinds of files available on Government websites! The XLS files tend to be forms; the PPT files are predictably presentation slides, but it’s interesting that some of them come from workshops or training sessions. By the way, you can’t search for image files like GIF, JPG/JPEG or PNG. There is no difference between searching from the English or Bahasa Melayu version of e-darussalam. If you didn’t even know that e-darussalam is available in two languages, then, er, carry on. Okay, honestly, these aren’t great. But for the sake of completeness, I’ll include it. You may notice a drop-down list next to the search box. It appears only on the search results page, or when you’re using the short and long URLs I gave you earlier (http://is.gd/govbnsearch etc). e-darussalam: You actually want to search just the pages of the e-darussalam website itself, i.e. the public pages starting with www.gov.bn. Tenders: This was supposed to search for pages with information on Government tender notices, including those on Pelita Brunei. Titah: This was supposed to search through the text of His Majesty’s Titah or speeches, specifically those on the Prime Minister’s Office website. The “Tenders” and “Titah” searches do not work very well, which could be due to the use of outdated URLs. But all is not lost… just inconvenient. There is, of course, the Pelita Brunei website, home of tender notices. Ministriy and Department websites often have their own list of tender notices. e-darussalam does have a small list of specific webpages for tender notices on Ministry websites, but only Ministries, and not Departments. You can find the link to “Tenders and Quotation” on the Main page of e-darussalam, under the banner, in a small section called “Quick Guide”. The Prime Minister’s Office website keeps an archive of HM’s Titah dating from 2007. They are mostly in Malay. You might also be interested in the archive of sabda by HRH the Crown Prince, or an archive of speeches by senior officials (PMO only, I think, and not comprehensive). I can understand if this doesn’t impress you. Most Ministry websites already contain a list of links to their own Departments. Still here? Well, thanks for still being interested. Method #1: At the top of the page, on the narrow dark grey bar, click the link for “Government Directory“, or “Direktori Kerajaan” if you’re coming from a page that’s in Bahasa Melayu. You will arrive to the Government Directory, this rather clunky but functional list of Ministries, along with general telephone numbers, e-mail addresses, website link, and ooh, their Facebook Pages if they have one. As with such types of information, it is likely to have some outdated information. The information for PMO above, for example, may not reflect their new building at Jalan Perdana Menteri/Jalan Menteri Besar. Method #2: Click on the Government tab, next to the search box. The result is an awkwardly-named “Government” page, which has never been able to decide if its audience is the general public or civil servants… but I digress. 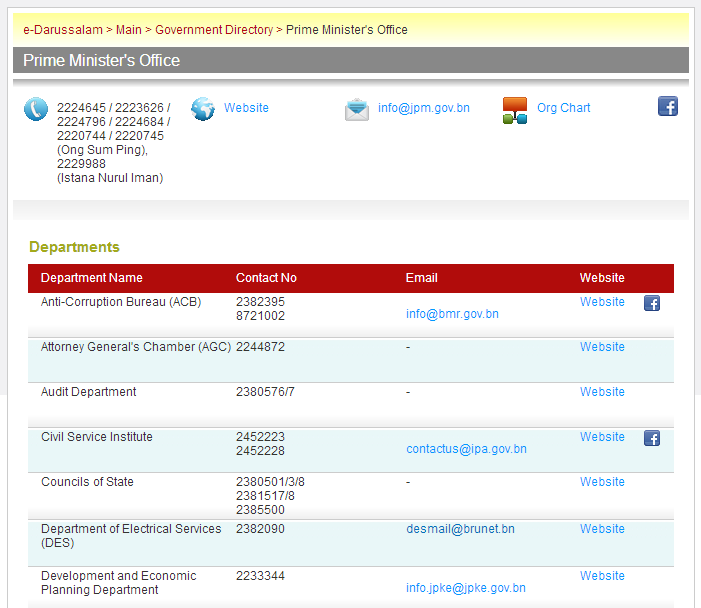 Look at the left sidebar for “Ministries Contact”. 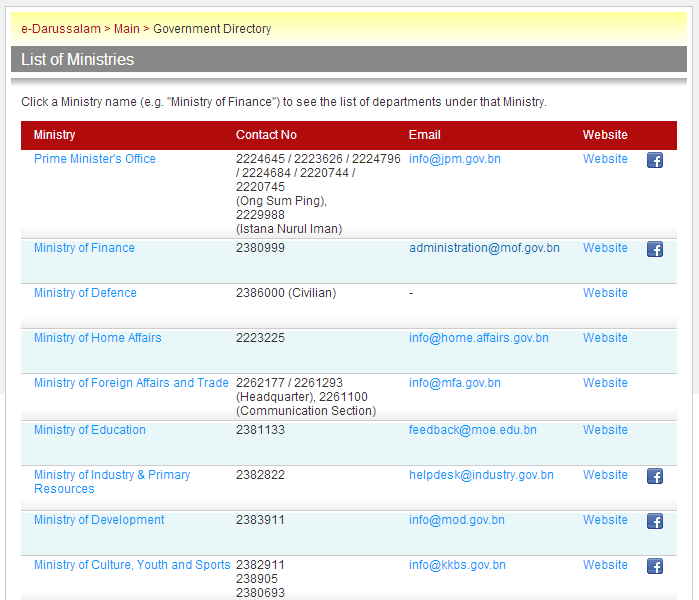 Clicking on any of those Ministry names will bring you straight to the Ministry’s page, with its list of Departments, in the Government Directory. Find the “government”. Oh, there it is. Go to the sidebar and look for this. You may have heard about “registering to e-darussalam” and omggg I don’t want to go into any of that. i. Where do I find these FAQs? Well, they aren’t actually hidden. There’s a link right there on the Main page, over on the left sidebar. 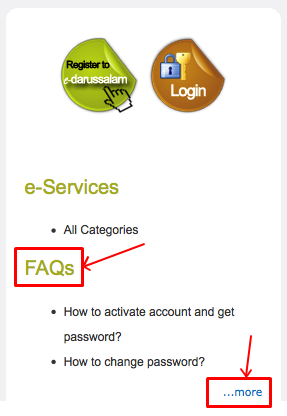 How do I activate my e-darussalam account? Received an acknowledgment e-mail from e-darussalam@egc.gov.bn. Please visit any of the authorised Government counters, and take note of which counter you should visit and which documents to bring. If you have activated your e-darussalam account, your password has been e-mailed to the e-mail address you used during registration. Do I need to change my password for the first-time login? Yes. You need to change your password before logging in for the first time. And, I may as well as mention this, NO, you currently cannot do a full registration online. That last part with going to a Government counter is required. Yes, I know this is a crappy deal. Sorry. This isn’t greatly important, and I’ve already mentioned it a few times, but what the hey. [Edited] I do appreciate comments and feedback on the writing of this guide, its presentation, or any relevant errors!